1. “Skirmish time is now!” This is one of the first catchphrases Buffer tried out, inspired by the thesaurus entry for the word “fight.” Unfortunately, the magic of the creative word choice failed to get the audience riled up, even when Buffer continued to tweak the phrase (“Brawl hour is imminent,” “The quarrel era happens promptly”). 2. “On your mark, get set, boxing match!” What works in one sport doesn’t always transfer to another. Buffer learned that the hard way when he tried this catchphrase out at Madison Square Garden to a lackluster response. 3. “Its clobberin’ time!” Marvel’s legal team made sure this catchphrase didn’t last long. The fight at last between two muscled men. Of heroes who must prove their strength again. Prepared to jab and cross and block and hook. They try to best their foe with just a look. For in their corners our two fighters stand. And who will win the day and raise his hand. 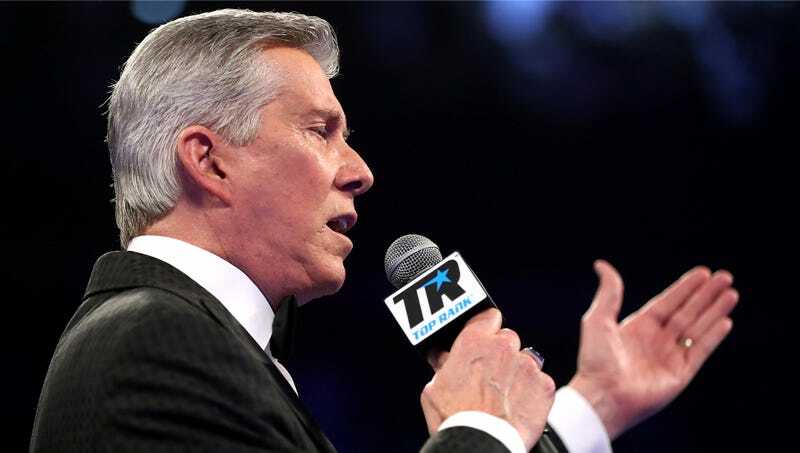 Though notable for its clever rhyme scheme and impressive command of iambic pentameter, this beautifully rendered sonnet simply didn’t get the appreciation it deserved when Buffer shouted it to a rowdy crowd of 17,000 boxing fans at the MGM grand. 5. “Ladies and gentlemen! Feast your eyes on these half-naked warriors! They dance for your pleasure! They destroy each other for your delight!” For this unique call to action, Buffer tried a slightly more intense, almost mystical tone that made everyone in the audience feel pretty uncomfortable. Some people even began to question the morality of enjoying boxing at all, which wasn’t great for business. 6. “Oi, guv, let the fellows wallop, innit!” Buffer first tested out this one-liner, delivered in a thick cockney accent, after spending some time in England. Unfortunately, most Americans didn’t really understand it, and Brits mostly found it deeply reductive of their culture.